Indium Corporation has released Indium6.6HF Solder Paste – a new water-soluble solder paste that is compatible with both SnPb and Pb-free alloys. Indium6.6HF is designed to provide exceptional stencil printing performance and minimize voiding in PCB assembly applications. Indium6.6HF exhibits superior wetting to a variety of surface finishes resulting in the fewest voids, a reduction in the size of the largest voids, and minimized overall voiding. 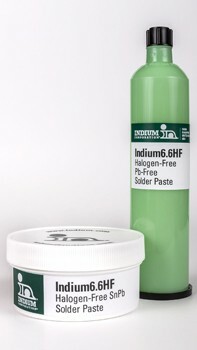 For more information about Indium6.6HF, visit: https://www.indium.com/solder-paste-and-powders/water-soluble-products/. For more information about Indium Corporation, visit www.indium.com or email abrown@indium.com. You can also follow our experts, From One Engineer To Another®(#FOETA), at www.facebook.com/indium or @IndiumCorp.